Backgroundset (or short BGS) ships more than 130 sounds, images for all standard GUI-Screens and visual effects for docking/launching and hyperjumping. It enhances the overall look and feel of the game and is expandable. BGS 2.5.1 requires Library 1.7.1. Radio chatter when in the aegis of the main station. Timed countdowns (via patch for other soundpacks available too). Visual effect for launching/docking, hyperjumps and exits. Last edited by Svengali on Wed Nov 21, 2018 12:34 pm, edited 15 times in total. Oh wow that looks so beautiful. Cant wait! Website www.richarddaborn.co.uk lots of sci-fi art. Oooh… this is really nice... looks great in-game. A real enhancement to the immersion factor. Well Done guys - beautiful and so professional! Just tried out the BGS oxp. The background images don't match what you have previously posted in the first part of this thread. All I get is the function buttons down the left, the border around my name at the top and the rest of the background is black. Also I don't like the background noises/ambient sounds. Can I not turn them off? EDIT: I see from the wiki page that the oxp is compatible with OXPConfig2. However as far as I know this hasn't been released yet. 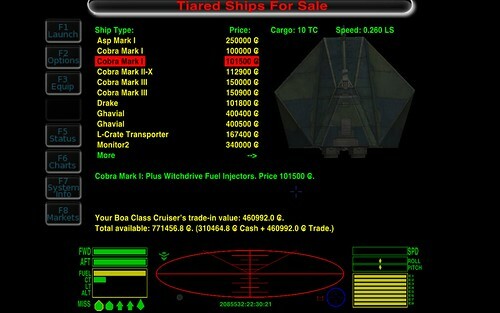 The beauty is now OXP makers can really customize their ship to the full extent and the sound side was missing. Now you can really make a Krait that sounds like a Krait (just a crazy example). The traffic control sound let's you hear when in the Aegis. It includes so many things that I can't imagine being without it. JazHaz wrote: Just tried out the BGS oxp. The background images don't match what you have previously posted in the first part of this thread. All I get is the function buttons down the left, the border around my name at the top and the rest of the background is black. Don't know why your machine is always running into trouble. For me (and the testers) it works pretty well, so I'd think it's your machine. Again. JazHaz wrote: Also I don't like the background noises/ambient sounds. Can I not turn them off? Sure. Reading helps in most cases. JazHaz wrote: EDIT: I see from the wiki page that the oxp is compatible with OXPConfig2. However as far as I know this hasn't been released yet. Hi Jazhaz: Did the following OXP work on your machine? About the sounds: you can replace them with your own or delete them. The beauty from BGS is that it is a sound, image and ambient engine for Oolite. pagroove wrote: Hi Jazhaz: Did the following OXP work on your machine? Don't know, didn't try it. Didn't like the idea of RED backgrounds! pagroove wrote: About the sounds: you can replace them with your own or delete them. The beauty from BGS is that it is a sound, image and ambient engine for Oolite. Thats as may be, BUT you don't tell us how to do it in the instructions readme! Not everyone is an OXP programmer who understands what they need to do you know! Why release something that is not fully ready for release with all the instructions required? Don't like your attitude. Rude. Reading? Reading what exactly. NOTHING IN THE README MENTIONS HOW TO DO THIS! Calm down a bit. no need to write in capitals or with: !!! Last edited by pagroove on Fri Jul 16, 2010 5:45 pm, edited 1 time in total. @ Jazhaz, Please tell which sound you want to remove. All ambient soundin the station? We wanted to expand the descriptions of how to do things later and first release it. But please try to be calm. We make these OXP's for nothing and in our free time so.. Excellent work, P.A.Groove & Svengali. It ran fine on my machine, I flew it for about 45 min to put it through some paces before saving and exiting to give feedback. I like the background images, they give a nice set of ambience. I found them nice and not overly "splashy". I think that the background capability has the potential to add a lot to the feel of some mission OXPs. I haven't tried the extra soundset yet, but I previewed those sounds and they seem quite promising. The default soundset BGS comes with is very good. I like that there's engine-up and engine-down sounds. With subwoofs on and running the volume just a teeny bit excessive, it was deee-lightful! I like what you've done with the weapons sounds. The ambient chatter and engine noise layer in really well. I was also running Hyperradio and it felt like it all flowed together. There were no moments when a sound combo felt inappropriate or jarring. Anyway, two thumbs way up, it's a great piece of work, and it's definitely staying in my add-ons folder. I like it a lot. To be fair, JazHaz, you really should check your machine. For me it looks as if the alpha-channel is not working on your machine and has nothing to do with any oxp. And the script is probably also not suitable for your machine as it will need a bit horse-power to work, but we'll see. JazHaz wrote: Reading? Reading what exactly. The WIKI holds this info. The switches for enabling/disabling are explained and there's only one script (with comments for the properties). Simply set the things you don't want to false. And if somebody wants to disable a specific customsounds sound remove (or set it to "") the key in customsounds.plist. JazHaz wrote: Don't like your attitude. Rude. And rude or attitude? No. I think rude is to complain about a not oolitish style and a few days later posting that you're using a very Star Wars like March for your glory game sessions as docking music. Exactly that kind of posts is taking the fun away. Let's step to PMs to sort this before it starts to get a cascading fireworks. We're old enough to talk about it - PM is underway. - Disabling keys in customsounds.plist - set to "bgs-m_silence.ogg". Last edited by Svengali on Thu Sep 23, 2010 1:58 pm, edited 1 time in total.